Braving acorns underfoot and projectile from the overhanging oaks, a trio of dancers led by Rashaun Mitchell and Silas Riener, Mellon Artists in Residence at Wellesley's Susan and Donald Newhouse Center for the Humanities, presented a site-specific performance called reveal on the Academic Quad last week. 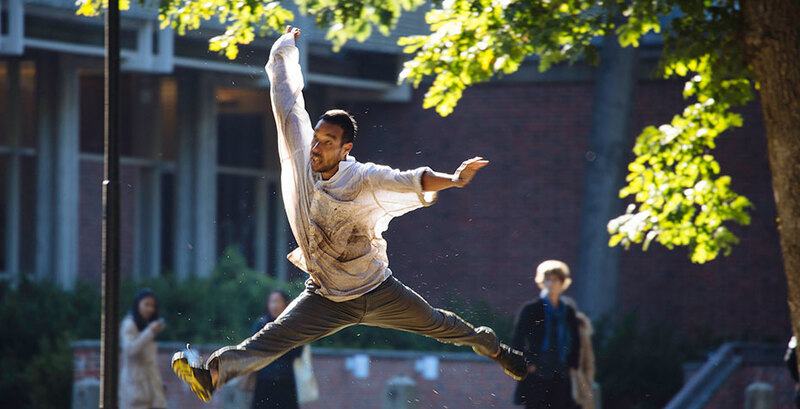 Boston Globe reviewer Karen Campbell wrote about the event, calling it "something like child's play" and describing the dance as well as the landscape of the Academic Quad, which in a real way served as a fourth performer. She writes that the beautiful but chilly weather, the trees, birds, randomly grouped people, and ambient sounds "set the scene for a work designed to explore how performance can transform space and spark dialogue. Periodic bursts of acorns fell from the trees onto both audience and dancers, adding an extra layer of wildness to the work’s provocative vignettes. And for the most part, Mitchell and Riener... along with guest dancer Cori Kresge seemed to feed off the energy of the open air." In concluding her review, Campbell surmises that "part of the point seemed to be to invite wonder, stir the imagination, and foster heightened perception in a space newly transformed by the action therein." It would appear to have been successful at that, given audience comments captured in this video about reveal, by Lucy Shen '17, which includes scenes from the performance and interviews with the dancers. Throughout the fall semester at Wellesley, Mitchell and Riener, former Merce Cunningham dancers and Bessie Award winners, will create a series of works, research, and encounters that rely on and play off of the intersections of the natural world, the built environment, and fictional space. During their residence at Wellesley, they will collaborate with faculty and guest artists, hold workshops with students, and present more site-specific demonstrations "in an attempt to animate the campus and expand ideas of transformation of space, transformation of self." The Mellon Visiting Artist in Residence Program is supported by a grant from the Andrew W. Mellon Foundation.